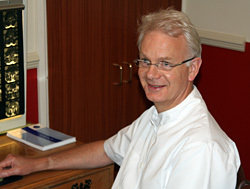 Having graduated from The British School of Osteopathy in 1979, I opened my first practice in Saffron Walden in 1980. Four years later, I opened a second one in Newmarket and ran the two until 1998 when the Saffron Walden practice was sold. Since then, I have worked full time in Newmarket and intend to do so for years to come! I am registered with The General Osteopathic Council, the sole professional register, which demands high standards of proficiency and binds osteopaths to a strict code of conduct. Like many professions, continuous training and development is ongoing and compulsory. Other than work I enjoy playing golf and tennis, both of which I have played most of my life and thus have a good understanding of the mechanics of injury! I am married to the Practice Manager and we have 3 children in their 20s. The present clinic now accommodates other therapies which inter-relate well with osteopathy. Banni Koviely, a specialist in acupuncture, practises at the clinic two days a week and there are regular sessions available with a reflexologist (Anna Ludlow ), Cognitive Hypnotherapist (Jan Gilbertson) and Counsellors (Gwen Montgomery, Kim Bowers). We are members of the Institute of Osteopathy. All management, administration and reception is run with efficiency and good humour by my wife, Liz! We strongly believe the more relaxed a patient feels, the more effective the treatment is.